Well Ive been meaning to post this for a while now...well actually nearly 2 years! I just never got around to posting. I have actually made 5 of these in the meantime and this time I decided to take some pics, so that Id have something to post! Ok so the host I used in the latest build was a Convoy 8 (the new version). The latter is a much bigger beast for significantly longer run times and better throw and flood. It takes 2 x 26650 and the head is much larger and also deeper. The driver I used in all of these builds was the Nanjg-105C-3040mA version. 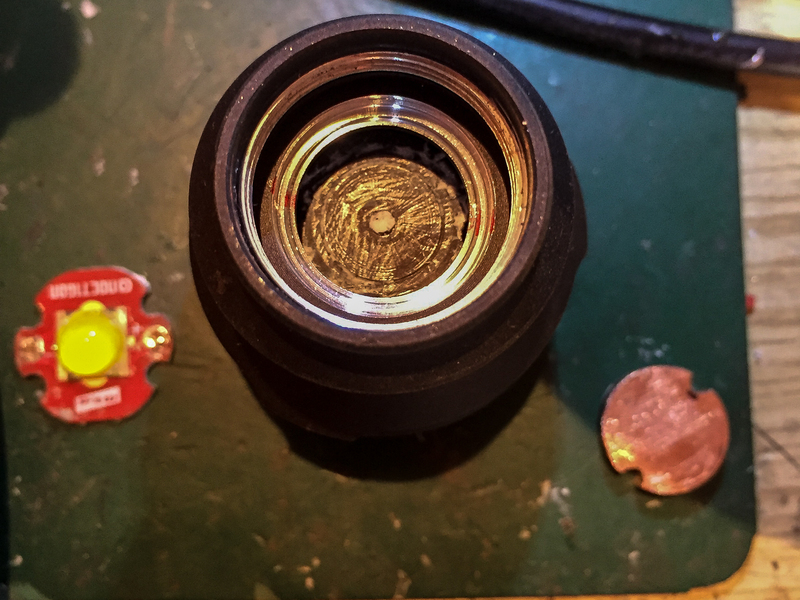 You will need to remove the spring on the base first, with a little heat from the iron and an pair of thin pliers. 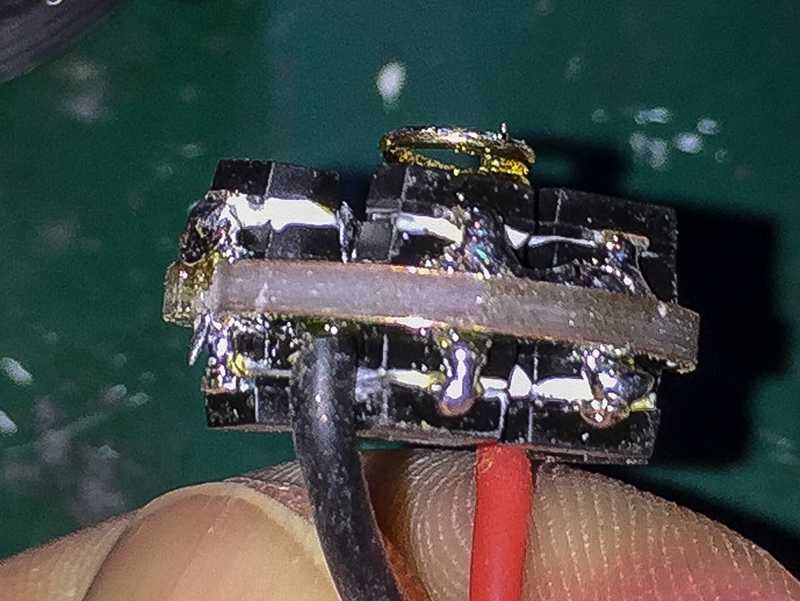 The leads will need to be replaced to so you can de-solder them. Epoxy an AMC chip on top of each of the 8 chips on the board. At present the driver gives 3040 mA, so doubling the current will give twice this! 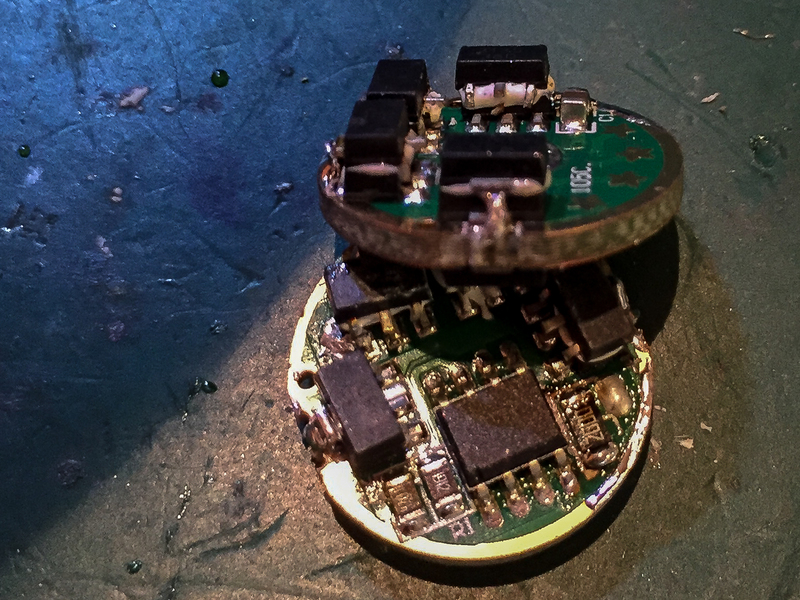 Then we need to add the Zener diode across the capacitor on the back of the driver you need to check that the cathode (side with line) is soldered to the cap and the other end the anode goes to ground. 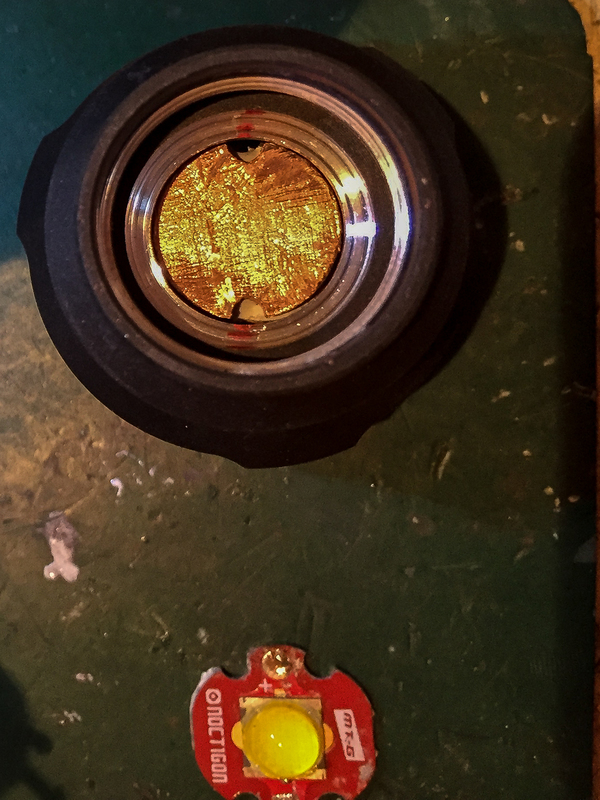 Now solder each of the metal ground pads at the back of the chips to the ground pads below. 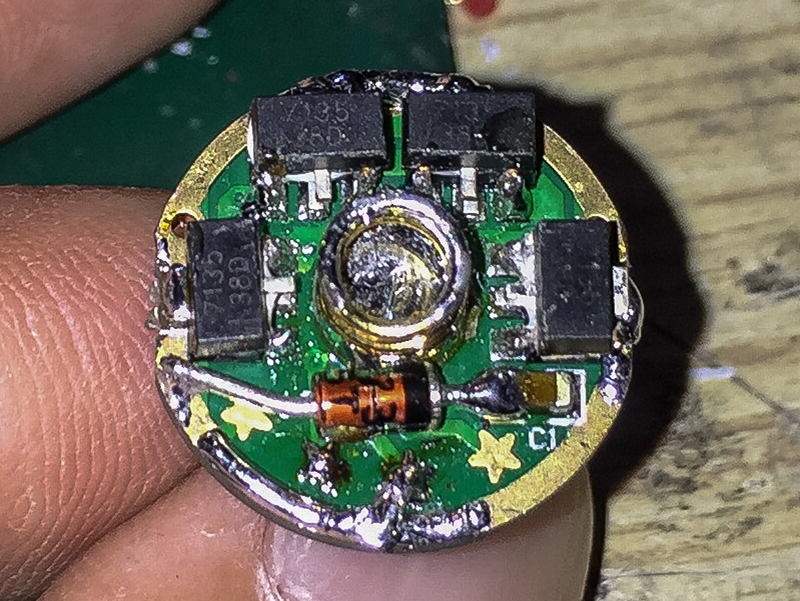 Once this is complete solder the right hand side pin to the right hand side pin on the chip below. Do the same for the LHS pins on the chips. Leave the middle ones as these are the ground pins again. This can also be seen in the pics directly above and below. 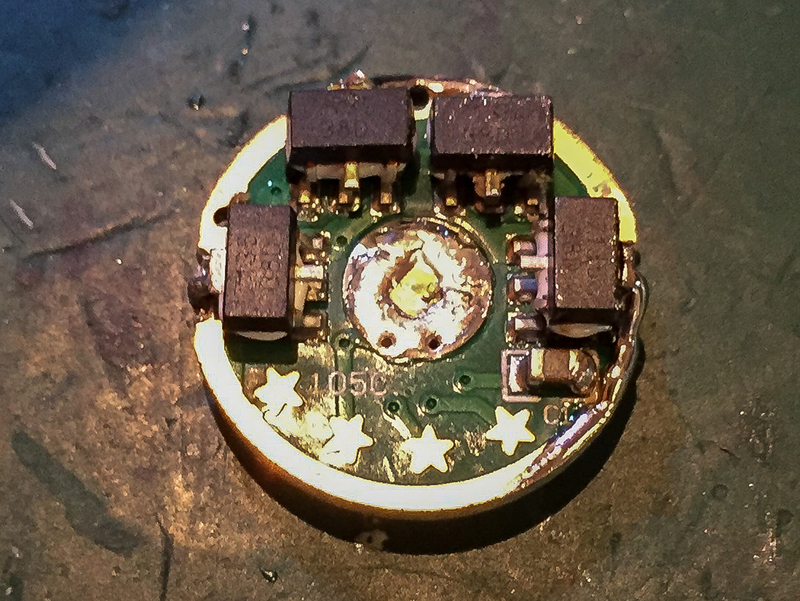 Whilst doing this it is best to solder each chip individually and test. This way you can discover any problems and rectify them before moving on. 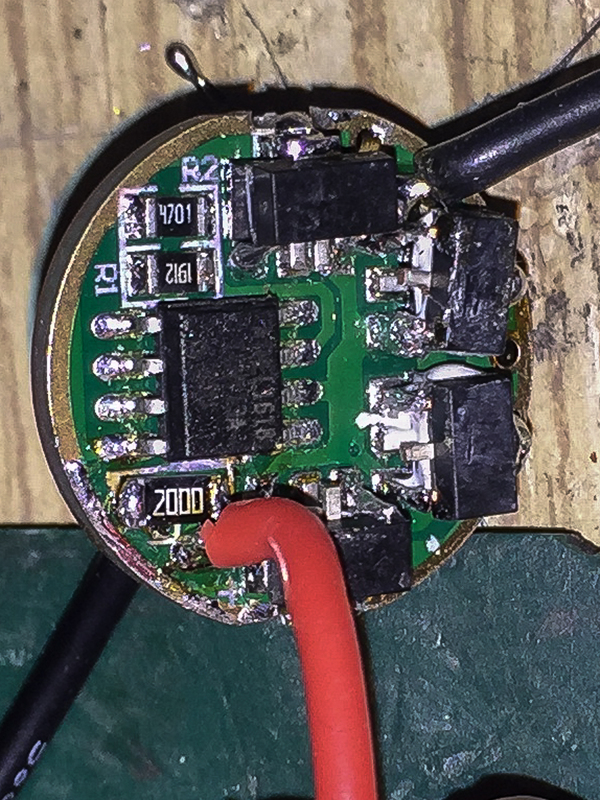 Its difficult if you've soldered everything up first and then test, as you wont know which of the 8 newly soldered chips is not soldered properly...:tinfoil: Finally remember to select your modes by soldering the respective star to ground in my case I chose; High 5.8 A, Med 2.5 A, Low 0.3 A. The stars and their functions are explained on the Kaidomain page for the driver (link above). 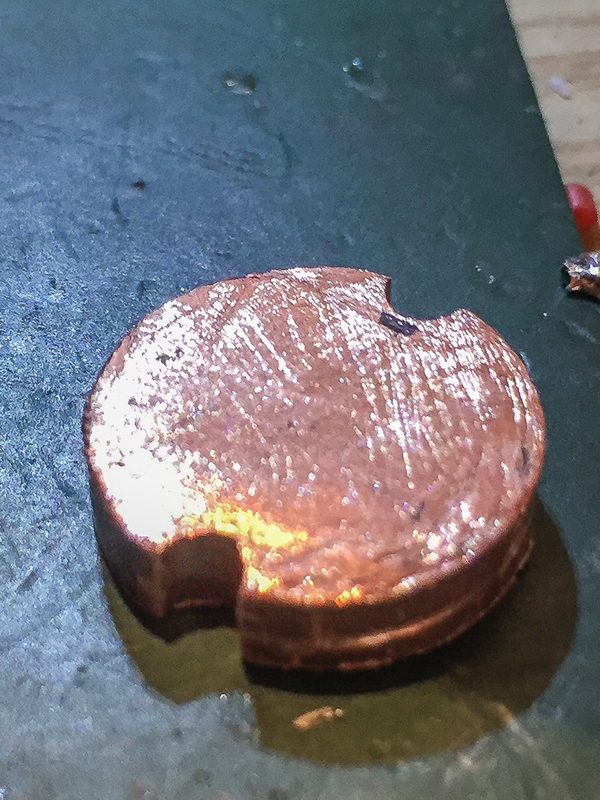 The copper block was cut to the right height so that I could simply glue the driver to it. and here with the driver in place. 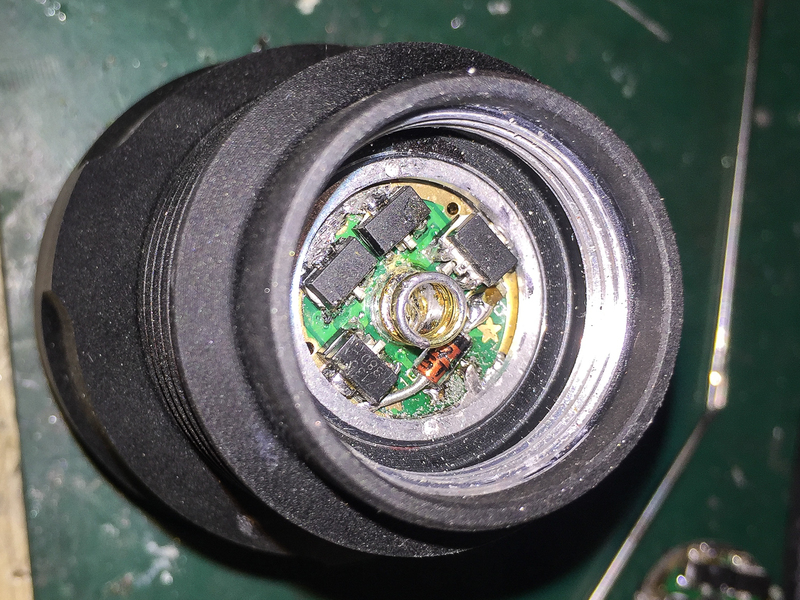 You will note that as you cant remove the pill you will need to make your wires longer or it will be very difficult to solder the wires to the MT-G2 inside the head of the light. The heat sinking is good! Remember to add plenty of thermal paste between the back of the copper base plate and the pill mount! 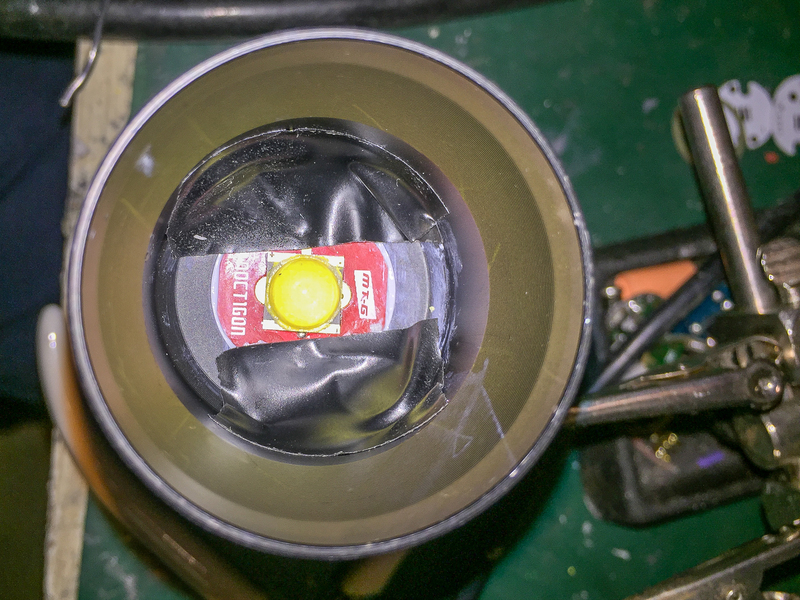 The wires and contacts were then covered with electrical tape to tidy things up and prevent shorts against the aluminium reflector. Here is a pic with the reflector in place. 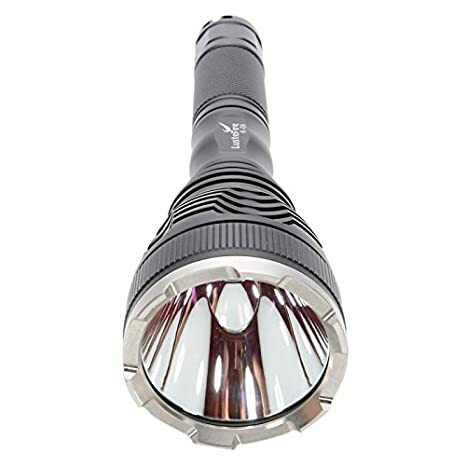 Cool flashlight build, wouldn't mind seeing some shots of the output too. Also pictures are big, you might get some complaints about that. Hi EP, I actually resized them to 2 MP just as I have always done? :thinking: Lets see what the others say, if they complain Ill reduce them to 1 MP? Very nice, I like super bright FL's too. What would you say about installing this LED as a secondary light on the handlebars of a dirt bike? Without a reflector (or with the right type), would it be bright enough to illuminate a wide angle out to 15m or more? I'd like a robust light I can use while on dirt roads in the evening at low speeds. 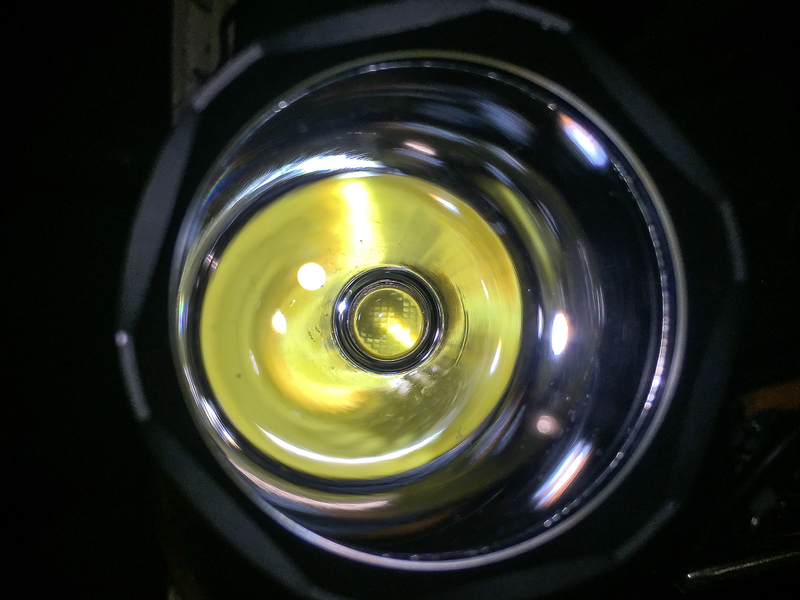 I haven't worked out what housing to use but I've been looking for bright, efficient LEDs. Thanks guys! They are fun to build too Its great walking through a dark forest and then lighting them up Only problem with the C8 is the capacity of the 2 x IMR 18350s needed to run it. This is why the bigger Lustfire host is better for much longer run times. Both get very hot though! Shouldn't be a problem the led is quite big so it floods very well. If you want to enhance this go for a wide but shallow reflector. 15 m isn't a problem Just remember it will need very good heat sinking at this current so it would be best housed in something with fins - active cooling when you are moving. Yup sorry the pics aren't that great, they were taken on my phone in low light whilst building. They were however meant to serve more as informational than pretty! Shall do, thanks for the update. 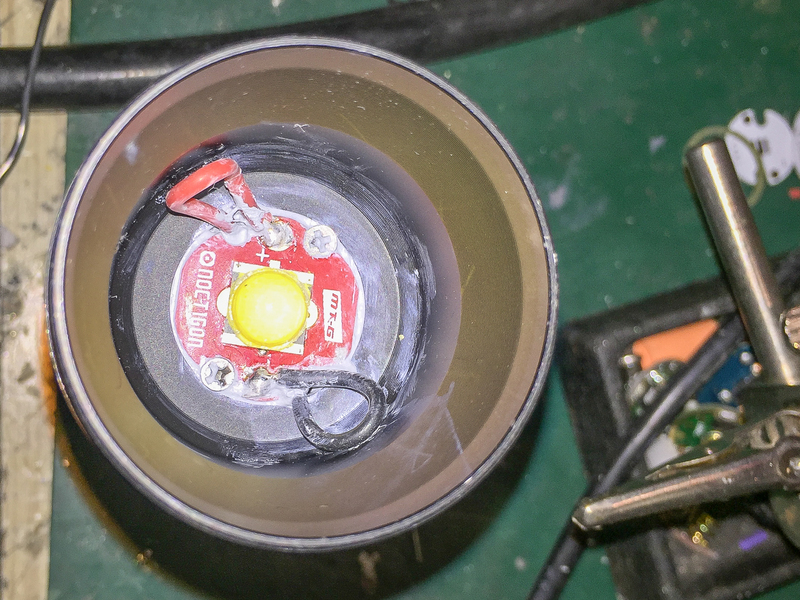 How high these MT-G2 Leds can be driven?